Linear Piezo Stage LPS-35, Piezo Motor Positioner. 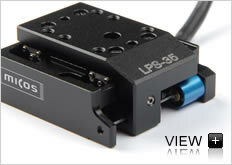 The linear piezo stage LPS- 35 is specifically designed for precise positioning of small components. They are ideal for a variety of applications, such as Micro- , Nano- technology, Bio Technology, Microscopy and R& D. LPS- 35 stage are working in open or closed loop mode, where a resolution of up to 50 nm is available. Due to the principle in open loop there is no repeatability. It is directly driven with an inertial piezo motor without any backlash. The travel range is 6. 5, 13, 26 or 38 mm. mounting the stage to an XY assembly can be made only with a special mounting adapter and must be specified when ordering.